These words were quoted by Maggie Henry and Bertha Jones in a newspaper article in the 1950s. The Arvonia Historic Preservation Society, founded in 2014, is making this statement a reality not only in spirit but in keeping the history and story of the Welsh founded community alive. The society is doing this through many avenues. The AHPS was established to promote the Arvonia community and its Welsh heritage. The society’s mission is to provide guidance in the preservation and restoration of the Welsh settlement of Arvonia. A part of this mission is to raise awareness of the community and to share the history of the school, church and community as a whole. This includes the Welsh heritage that was once a very important part of this community. AHPS is in the process of restoring the school and church buildings still at the former town site. The organization is raising funds for the upkeep, preservation, and restorations of the buildings through private donations, fundraising and grants. Arvonia was established in 1869 by Welsh settlers led by John Mather Jones. Arvonia was once home to over 700 residents. The town originally had a sawmill, general store, a cheese factory, the Dooley Hotel, a blacksmith shop, two churches, a school, a town hall and other buildings. Arvonia’s most recent news of significance is that descendants of Prince Owain Glyndwr actually owned land in Arvonia. They were some of the original settlers. Owain Glyndwr was the last native Welshman to hold the title of Prince of Wales. The school was designed by architect John Haskell in 1872. 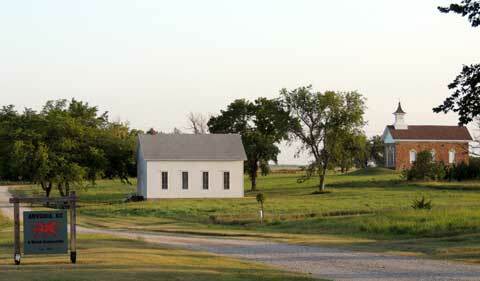 He has designed other prominent Kansas buildings including courthouses and churches. It is one of the earliest-known architect-designed schools in the state. The building was constructed by Welsh craftsman James Rice. It has become a Kansas icon, immortalized in the art of photography and legend of the region. It was originally constructed as a two-story building. The school consolidated and was closed in 1949. The Calvinistic Methodist Church reflects the simple architecture commonly used by Welsh congregations. The church was the center of religious and social activity in the community and was in continuous use as a church from the time of its construction in 1883 until it was disbanded in 1968. The AHPS has begun a project through the WeKan Network of the Kansas Sampler Festival, a “Tin Ceiling Revival.” The tin ceiling in the church was in terrible shape with part of the tin hanging. Most of the ceiling will be able to be used and some will have to be replaced. By visiting www.kanstarter.com, you can be a part of this project by donating to “revive a tile”. For more information about Arvonia, AHPS or the restoration of the buildings, contact Susan Evans Atchison at [email protected]. 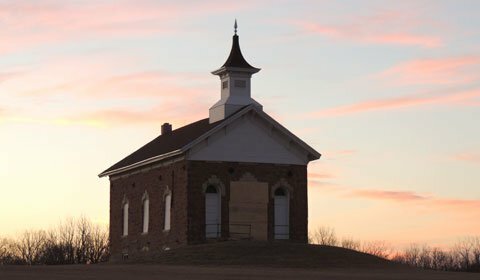 Two necessities of a community, a church and a school, remain at the former site of Arvonia, located in southern Osage County near Melvern Lake. Information and photos thanks to the Arvonia Historic Preservation Society.